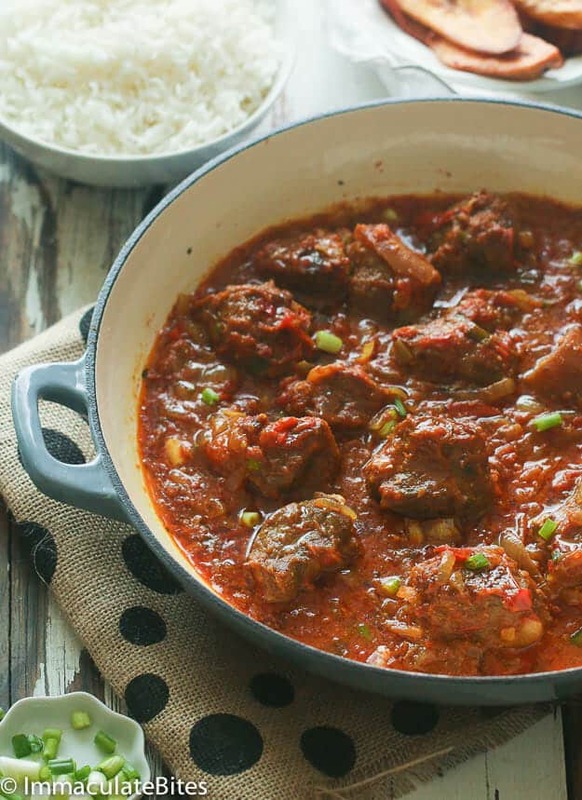 Curried Goat Stew — An amazing recipe for goat stew that is intriguing and spicy without being overly hot . 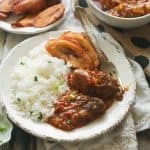 A stew widely consumed in the Caribbean and Africa. Ok, I know that goat meat can be off putting and you may have some reservations about eat it but don’t be so quick to dismiss it yet. Goat is one of those meats that is a must have in parties, birth celebrations, weddings and huge gatherings in the Carribean ,latin America and throughout Africa. In fact, did you know it is the most popular meat throughout the world and as an added bonus, it is great for your diet because it is lean and have less saturated fat , calories and cholesterol. 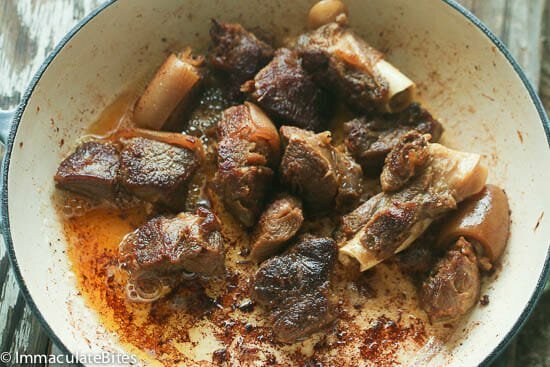 There are so many ways to prepare goat meat , however, slow and long is the best way to bring out its full flavor and make it tender. Be careful when shopping for goat meat the older the goat the gamier it will taste . Some people also attribute the gamey taste to the gender of the goat , female less gamey while male have a strong gamey taste. It is preferable to get organic goat meat because it is lean and full of flavor -in my humble opinion. If you are wondering what goat meat tastes like , I would say it is taste just like lamb shanks or beef brisket. So feel free to replace goat meat with lamb shanks or beef brisket. 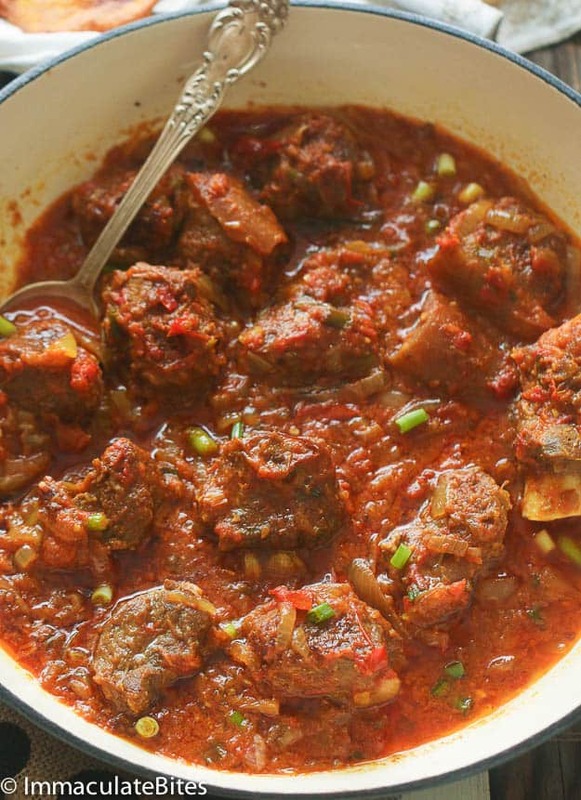 Here is an amazing recipe for goat stew that is , intriguing and spicy without being overly hot . 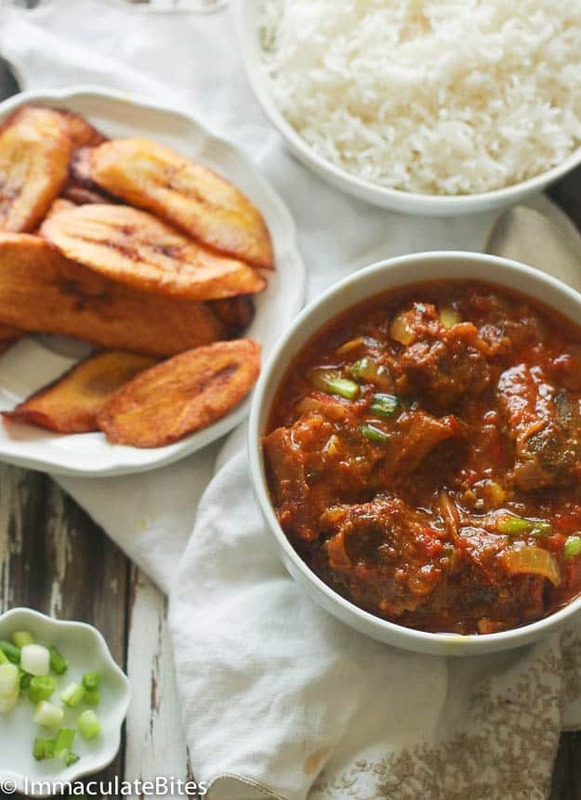 A stew widely consumed in the Carribean and Africa. The goat meat is slowly cooked for about 1-2 hours( you can cut the cooking time in half by using a pressure cooker, it is a must have for some one who likes cooking tough cuts of meat) then, fried with curry, onions, garlic, ginger and other spices , the earthiness of the goat meat blends in with the curry. You may adjust the sauce by adding more stock or water . Enjoy with rice ,fried plantains or any side order of your choice. Curried Goat Stew an amazing recipe for goat stew that is intriguing and spicy without being overly hot . 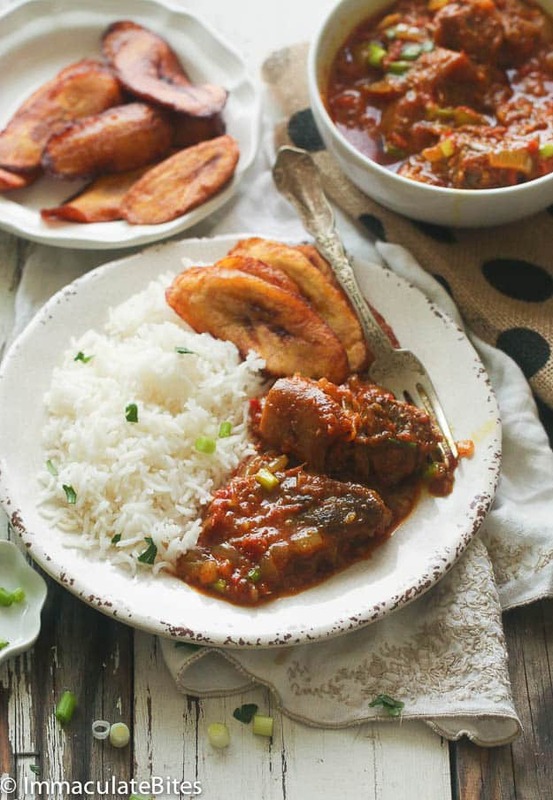 A stew widely consumed in the Caribbean and Africa. 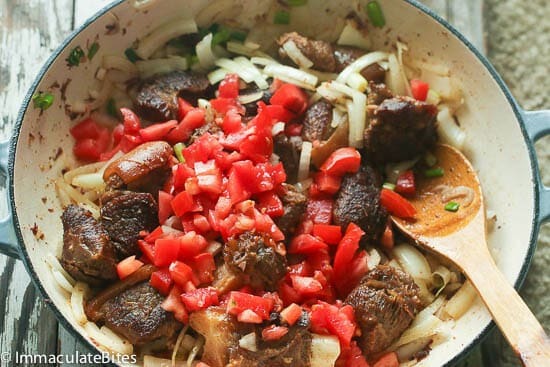 Boil goat meat with salt, pepper and some chopped onions in a medium pot until tender. It will take approximately 60 -90 minutes or more, depending on how you like your goat cooked. I sometimes use the pressure cooker to shorten the process. Reserve the stock for later use. Add ¼ cup oil to the pot/pan and brown the goat for about 5-10 minutes. Finally add green onions. Adjust seasonings, sauce consistency with water/stock and salt. Be careful when shopping for goat meat the older the goat the gamier it will taste . It is preferable to get organic goat meat because it is lean and full of flavor -in my humble opinion. Feel free to replace goat meat with lamb shanks or beef brisket. 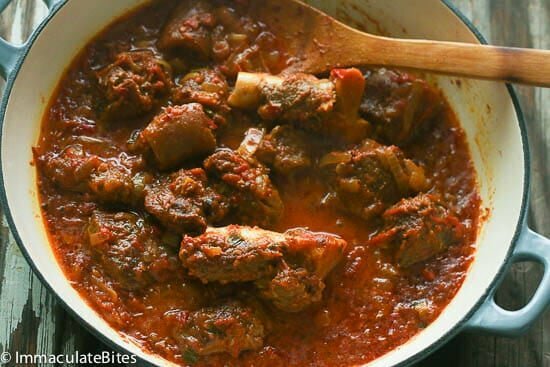 The goat meat is slowly cooked for about 1-2 hours ( you can cut the cooking time in half by using a pressure cooker, it is a must have for some one who likes cooking tough cuts of meat) then, fried with curry, onions, garlic, ginger and other spices. The earthiness of the goat meat blends in with the curry. You may adjust the sauce by adding more stock or water. Hello…my West Indian and AFRICAN roots love goat meat dishes. However, I was recently served mostly big pieces of skin and bones at Abuja Restaurant in Union. They claimed the skin is always used???? I was shocked! Tough, bones and skin are not the intended results of this dish! What do you think s another expert? I love YOUR quick and easy recipe for curried goat..1 question..do you marinate the goat w/the seasonings befor you begin cooking it? It’s best to marinate for optimum flavor. However, when in a hurry I do not marinate. Do I use boneless goat or bone in goat cubes? The meat market I go to only has bone in goat cubes. Is there another step I shod take when using bone in goat cubes? Like cutting the bone out at some point in the cooking process? Most places sell goat with bone in. If you cook the goat until tender the bone usually falls off . I serve my goat with bones- some people like to nibble on the bone. Hi Dawn. Welcome to the blog. Yes, I do have share buttons at the bottom post part of each post. So I consider myself someone who cant really cook, haha. But Imma your recipes are so hustle free, I cooked lamb stew using this recipe yesterday and hey have I seen people licking their fingers. I wish you long life. You make me feel like a real woman. Now I stay on this website. God bless you. Hi there. I am cooking goat for a friend from Uganda and have cooked a lot with lamb, but not goat (I was raised in France). Do I really need to boil the goat first? In water? Or broth? Can I use red curry instead of yellow curry? Hi, I always boil goat using water. Red curry works as well here. Happy Cooking!!! This is a wonderful dish. Savory and sweet with just enough heat to be interesting. We can’t wait to make it again. We used half and half young goat and lamb. I have recommended this to my friends and family. First things first. YOU ROCK!!! I’m a chef/foodie and I’m always looking for something different and exciting to eat. I was introduced to a African/Caribbean restaurant by son. The curry goat stew was love at first bite! To make a long story short, the restaurant closed and was unable to find another. All other online recipes fell short on taste. Yours is SPOT ON! I paired it with your African Rice and Beans (Black). It was a hit. As a matter of fact… my wife said that the rice was a favorite childhood dish that she has craved and missed for over 30 Year’s. This will most definitely be a go to dish in my house. I can’t wait to try my next dish. Thank you so much Burr! Glad to here it worked out well for you. So happy that you would take the time out to share this with me. Happy Holidays!!! The recipe calls parsley but you left out when to add it in the recipe directions. Making this tonight for my boyfriend and I. I’m nigerian but I lost my parents early and have had to teach myself the culture and cuisine. Thank you for spreading your cooking knowledge. I made this dish yesterday, and it was sooo tasty! i then wrapped this in tortilla for hubby to take to work, and he said it taste better the next day! What I did first, is put oil in the pot, browned the meat added 2 tblspn sugar, threw in garlic, and ginger, salt and black pepper. Then I added water and filled just to the tip of the goat meat. I let it cook on super slow heat for 3 hours, or until the meat falls off the bones. Then, in a separate pan, I added 2 cans tomato paste, and cooked that then added the goat meat, a cup of the juice from the pot, ginger, garlic then mixed and let it sit for 2 hours. I tasted the curry, and it was soooo good. That’s how I knew the dish was ready. Thank you for this wonderful recipe! we ate till there was nothing left! That’s what am talking about Shanon!! No left overs. That’s the way to do it. Thank you so much for sharing such detailed feedback with us. Definitely going to have some tortilla ready when I make this next. OMG! tried this for my wife during the mothers day and. …..my wife couldn’t stop praising me. She entered the kitchen tasted it and before I could see she was clapping her hands for me saying this is so perfect! . 10/10 rating. Ate it with boiled Ghanaian yam. Yummy! Chai! The aroma alone was just unbeatable! Thanks Imma . This week I am doing carribian curry goat with potatoes. Already salivating. Thank you. VIrtual High Five Fredrick !!! YESS! So glad to hear wiffy was pleased! Love Ghanaian yams, and yes , to the Jamaican curry goat. You are going to love it too!! Happy Cooking !!! I made this for a friend’s birthday party in Germany and it was a hit. Everyone loved it and most asked for more but it wasn’t enough. I even mistakenly left one of the habaneros I normally add fully to my foods and it broke and some of the guests had a hard time because they ate they part that was too spicy but when they recovered, they still wanted more. Great stew, absolutely delicious! Hahaha! So happy to hear this! Thanks for taking the time to share this with us . Hello! What type of bouillon flavor do you recommend? And when you say “cooking oil” are you referring to Palm oil? Thanks and I can’t wait to try this recipe! I usually use chicken or beef . Cooking oil refers to the oil you use for cooking stews, I use canola or vegetable oil. This was delicious!! I added some potato and carrots but otherwise made exactly as you wrote- YUM!! My Pleasure!!! Glad you liked it. Made it for my boyfriend (who is Zim) and he loved it. Thank you for such an easy, delicious recipe! Awesome!! Glad he liked it . Thanks for giving it a try. Am sure he will approve . Happy Cooking!!! I tried this recipe and it is quite tasty. Reminds me more of a goat stew I have had in Senegalese and nigerian restaurants than anything I have ever seen, cooked or eaten in Jamaica. Jamaicans dont put tomato in it; that how I distinguish between how continental africans and new world africans cook goat. Agree. This is Curried Goat Stew,as suggested in the title, my humble version, not specific to any country or region. 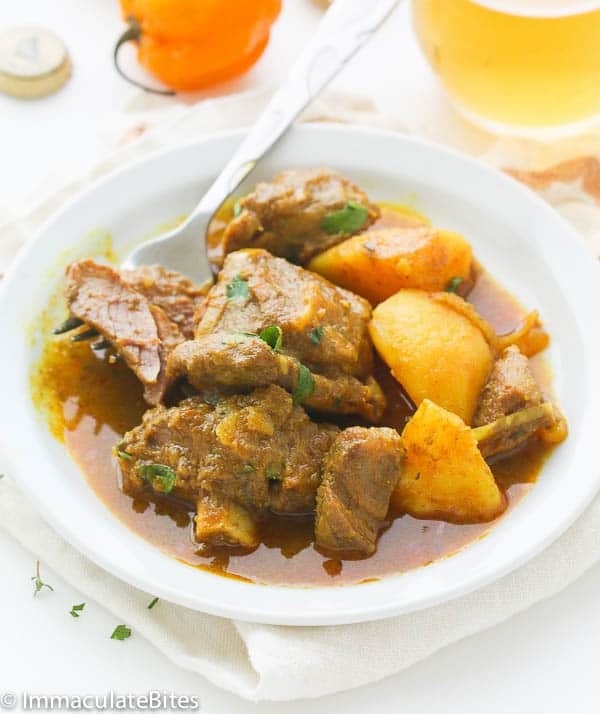 If you are looking for Jamaican Curry Goat then check this out here https://africanbites.com/jamaican-curry-goat/. Thanks for sharing!!!! I made this dish for my husband for thanksgiving and he LOVES IT! I’m from the U.S. and he’s from Nigeria. He liked it so much he begged me to made it again only two days later! !I followed the directions to the “T” the only thing I did differently was add spinach towards the end and let it simmer with the other flavors. 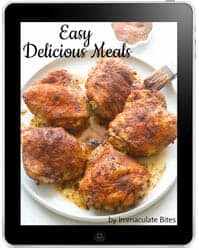 Thank you so much for sharing a easy to follow recipe for me and my family. Thanks for taking the time to share your thoughts with us. Now am going to have to share it with spinach. About 2 cups or more depending on how thick you want your stew. It wouldn’t hurt if you use more , you can always let it reduce to desired consistency. Recipe was deelish. I’m Trini and my husband is Vincincian so we both cook a wide variety of carib food. We both loved the recipe. I added a bit of lemon juice and orange zest, served it over rice with yam and Cabbage. Marc, you are so going to like it – let me know how it works for you. Yes it is!! in north of Mexico, the contribution of Jewish, Spanish and pre Hispanic cultures is still present in a cuisine in Monterrey Mexico. the grilled goat is one of our traditional dish….Mexico has a variety of traditional dishes. I am from Monterrey Mexico, it is a Industrial city located in the north, so our traditional dishes are flour tortilla, grilled goat, grilled chuck ( Agujas a las brazes), meat and Archera, grilled meat and chicken, driedmeat….best known as Machacado con huevo….in English..would be as a dried meat cooked with eggs and hot salsa…acompanied with flour tortilla…it is very delicious. Also, we have a delicious bread…sweet and salty….candies made by goat milk…like dulce de leche. But the dish that represents this beautiful city in Mexico and all over the world as the famous cabrito o baby goat. This delicious dish consist on a very young goat seasoned with lemon juice mixed with onion, pepper garlic and sugar and grilled over firewood . It can be also marinated in wine or beer depending on the taste of the guest. Mexico is o only about tacos, enchiladas….Mexico has a wide variety of dishes. Some people just know the TEXMEX food, that is not real Mexican food…..the best way too know our food, is to go to Mexico and I assure you that you are going to be surprised and very delighted. I tried this recipe and served it over millet. It was a big hit! It’s funny someone mentioned Mexican food. I made it for my boyfriend’s family, who are Mexican, and they loved it-kids and adults alike. His mom asked me for the recipe so she can make it! Thanks for the tasty idea. My husband loved it. He says it’s one of the best stews he has ever eaten . Thanks, it was delicious. Aww , thanks.Tell your husband is AWESOME! I had goat when I went to Jamaica, but I completely forgot about it since then! This recipe makes me want to run down to the Halal grocer and get me some goat. Gina, you should do that! Thanks for stopping by! Aww, thanks for the 4 stars, however, I need for you to try this recipe and let me know how this compares to the Mexican curry goat. I do appreciate the comment!